Dentures are a dental restoration option that can restore the appearance and function of your teeth, stimulate your gums and help maintain your facial muscles. Our specialist for dentures in Torrance can use partial dentures when only some of your teeth are missing or complete dentures when all of your teeth are missing. 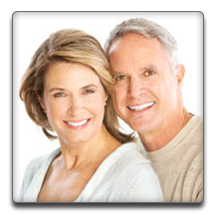 Our Torrance dentures dentist can help you determine if you are a candidate for dentures. Partial dentures tend to consist of a metal framework designed to hold the denture in place. The replacement teeth and a gum-colored base are connected to this framework for a natural-looking restoration. Complete dentures are composed of an acrylic gum-colored base and replacement teeth and are held into place using suction and gravity. In some cases, dental implants can be used to support either full or partial dentures. If you are a candidate for dentures, you will need several appointments with our specialist for dentures in Torrance. Your first appointment will involve a comprehensive evaluation and a series of dental impressions and images and that will help our dentist measure your bite, the space between your jaw and other critical elements of your smile. Models may be created to help determine the best shape, position and color for your new smile before your final denture is made. Once your denture is completed, our dentist will make any necessary adjustments to ensure a comfortable fit. Our Torrance dentures dentist will provide you with instructions for wearing your new dentures so that you can adjust to them. You may need to wear them constantly over the first few days, but once necessary adjustments are made, you will generally need to remove them at night to allow your gum tissues to rest. Your new dentures will need to be cleaned just as your own natural teeth, and our dentist will provide you with instructions for doing so. You will also need to keep them moist when they are not being worn. Although denture adhesives should not be necessary if a denture fits properly, some patients may be more comfortable using one. However, if you notice that your dentures are no longer fitting as well as they once did, you may need to contact our dentist for an adjustment or further evaluation. If you have lost teeth, contact our Torrance dentist today to learn more about your options for tooth replacement.